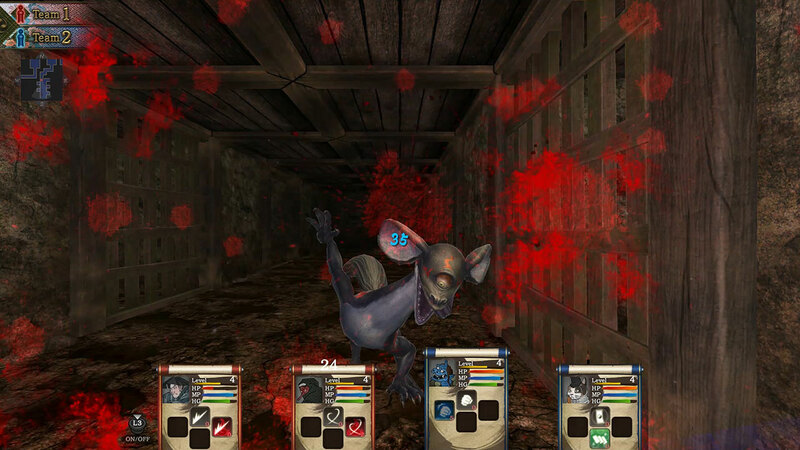 Haunted Dungeons Hyakki Castle PS4 Review - Who Ya Gonna Call? When it comes to first-person dungeon-crawlers, the vast majority of them are turn-based affairs. These days they typically lean hard on the anime aesthetic, adding lots of color and personality wherever they can to mask the more focused, old school gameplay. However, every now and then one shows up that flips the script a little, giving real time combat a shot or taking itself a little more seriously in its setting and aesthetic. Haunted Dungeons: Hyakki Castle does both, rooting itself in the creepier side of Japanese folklore, and pitting the player against ghouls and ghosts in a dark, quiet environment. While the concept is intriguing, the mechanics feel unique, and the setting is cool, Haunted Dungeons: Hyakki Castle doesn’t quite have the muscle to make the overall experience required reading. Set in the Edo period of feudal Japan, players can customize their own group of yokai ghostbusters from a variety of races and classes. From there, the game is all about navigating the mysterious Hyakki Castle, which is full of traps, puzzles, and of course supernatural threats. Most of these threats can be taken care of via well-timed stabbing, but perhaps the greatest threat is the elements, and of course hunger. While it’s possible to get ripped to shreds by baddies if you aren’t paying attention and being careful, the real time nature of Haunted Dungeons means it’s just as possible to dance around most offense. This is especially since the game’s overall pace is surprisingly slow. It’s a horror game, sure, but it also gives you enough space and time to react to your surroundings, and plan your strategy accordingly. That pace is necessary, especially since one of the key mechanics is a split that allows you to control two halves of your party independently. The party split is something Haunted Dungeons pushes often, and it’s a neat idea on paper. In practice, it’s cumbersome, a bit disorienting, and ultimately not very useful unless it’s forced upon you. Since you can’t control both groups at the same time, there’s a gimmick involved that turns your other party into a statue of sorts, boosting their defense so they can tank hits. This lets you flank enemies, which again is forced in certain situations that make enemies invulnerable to damage from the front. So you set up your flank, then swap back and forth to take potshots as the ghostie you’re engaged with turns around. Taking potshots is generally the nature of combat. Once you encounter an enemy, the general flow is to attack with the face buttons, swap characters with the shoulder buttons if you can, get in another attack, or strafe around the enemy with both sticks. It’s a dance around the whole controller, and things aren’t exactly smooth so you need to account for the time between pressing buttons and actions popping off. To that end, combat never really feels natural, and when enemies start doing things like teleporting around you after taking damage, it’s a whole new set of muscle movements to commit to memory. When you’re not fighting, you’re simply finding your way around the dungeon, avoiding traps, and solving puzzles. Most of the time, puzzles involve throwing levers and stepping on switches that either open doors, disable traps, or help you find ways around traps. I would say the puzzles are in place to break up the monotony of combat, but it’s more the other way around since combat encounters are often isolated to one on one affairs, if not small groups. Much of Haunted Dungeons’ appeal is unfortunately limited by its low budget feel. We obviously can’t presume things like a game’s resources, but the environments feel sparse and lacking in detail or aesthetic flavor, the sound design is quiet and on the banal side when it does speak up (although the title theme is rad), and while the enemy models are often detailed and imposing when they need to be, the overall lack of pizzazz often puts a cap on the level of intensity one would want from a horror experience. I was also often too busy concentrating on wrestling with the controls to really get into the vibe, and the way things are presented doesn’t really help either. It also didn’t help that the UI is full of tiny text and details, so once again a lot of my energy was dedicated to concentrating on the mechanical side of things, squinting at the map and menus. If I had to describe Haunted Dungeons: Hyakki Castle in one word, that word would be, “fumbly.” There’s a lot of fumbling, mostly with the controls, some with the menus and UI, and some with getting around the maps with their samey walls and lack of landmarks. Real-time, horror-tinted dungeon crawling is a neat idea, and with the customization, skills, and cool monsters, there is fun to be had here. Multiple difficulty levels and post-game content also gives plenty of challenge for the genre hardcores. But this is a game that leaves me wanting more from it, but in a way that means the promise from the concept doesn’t match the experience in my hands. Haunted Dungeons: Hyakki Castle review code provided by publisher. Version 1.01 reviewed on a standard PS4. For more information on scoring please see our Review Policy here.